Is there a certain brand or "label" of marabou that you prefer to buy for tying jigs? The strung marabou that I always buy is very hit or miss as to the quality and how many decent plumes I get for tying with. Some packs are full of decent plumes and others are full of junk that I don't bother using. Most of what I buy is the strung marabou that Bass Pro sells. I buy the "woolly bugger" and the "blood quill" stuff, and I buy a bunch of it so I can dig through it and find what I need. Beings as how I tie trout, bass, and hybrid/white stuff none of it goes to waste. If you're tying jigs you can buy the big long feathers, tie them in by the tip, wrap forward, then sweep it back. Blood quill is what I typically buy for jigs. I guess it's just a matter of buying a bunch of it so I have a good stock of quality feathers then. I haven't tried palmering marabou before. 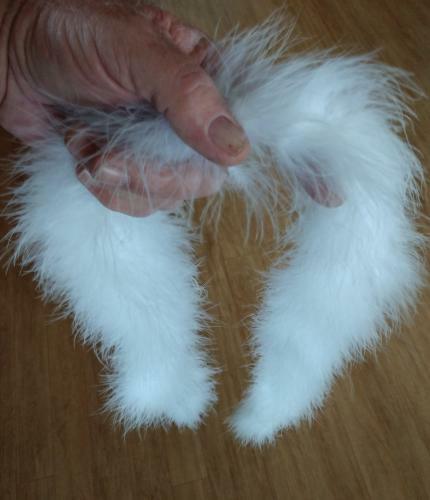 Another good source are these "feather boa" things. My wife found them at either Joann's or Hobby Lobby. They are like 4' long for 2 bucks. Is there a certain brand or "label" of marabou that you prefer to buy. I wish. There doesn't seem to be much consistency. Your best bet is to go in to buy it and get it in your hands. Other than that it's just a crap shoot and you buy a bunch and toss the rest. Like wrench I tie a lot of different things so I find a use for most or create some dubbing or just trash what I don't want. At least it's cheap. Yep, about $1-1.50 more than I need to be paying. I'll be stocking up on the colors that I use the most in the future from other sources for sure. Would head to your nearest fly shop and pick the packs you want. Usually buy the large plumes and pull the fibers off the stem. I've also struggled with my Marabou- I buy "premium" blood quills, but many are very short... Of course I'm tyin' some bigger stuff, but still. And mine are all palmered. Fly shop lets you see before you buy, Tim's name is on some of my stuff. I don't care much for the stuff marked "woolly bugger", I usually have bought the "Extra Select" but have a pack or two of the "blood quill" that are long enough to be useful. It is all a by product of Thanksgiving dinner.